ETAs are placed in three cities on Sulawesi this year: Gorontalo, Manado, and Makassar. The only site I hadn’t yet visited was Makassar, and since I had to pass through it to get to Tana Toraja, I decided to plan my flights to allow me two separate days in Makassar, to have a least a little time to explore this massive city (the largest on Sulawesi). While in Makassar, I was able to go to two different benteng (forts), Rotterdam, and Somba Opu. Fort Rotterdam, while not particularly impressive in and of itself (it’s not very big, and most of it has been restored, which means not much of anything original remains. However, there was a museum tucked off to the side that even included English translations of the signs (fairly high-quality translations, too), which gave wonderful insight into the various cultures found in southern Sulawesi. Various views of Fort Rotterdam. The other fort, Somba Opu, has, for the most part, not been restored. In some ways, this makes it more beautiful, but in other ways it makes it just a little more sad. Perhaps the most interesting part of the fort was the grave of an ancient king, which local people still brings offerings of food to every Friday night. Throughout the site there are also various traditional houses, examples of the architectural styles found all throughout South Sulawesi. These are very cool to drive by, but sadly tourists can no longer go inside them, because families have moved in, and are apparently living there for free, essentially squatting, according to the person who showed me around. Right, the hut where the ancient kind supposedly rests; left, one of the many traditional houses we couldn’t enter. Makassar, like Gorontalo, and much of Indonesia, is majority Muslim, and as such I also saw a number of masjid (mosques) while in Makassar. Masjid Al-Markaz Al-Islami is the largest mosque in Makassar, and is possibly the most beautiful shade of green I’ve seen. 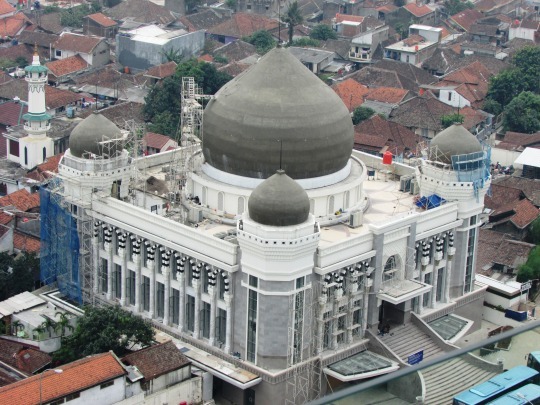 Masjid Raya is the second largest mosque, and it also houses one of the largest Qur’ans in Indonesia. My favorite, though, was Masjid Amirul Mukminin, which sits out on a pier, inspired by a similar mosque in Saudi Arabia. Typically, I don’t enter mosques in Indonesia, because I am never sure whether not I would offend someone by doing so. But my new friend Fera, the daughter of one of my friend’s co-teachers, who is Muslim, told me it is absolutely fine to do so, so long as I am respectful, and check with whomever is in charge as to whether or not I need to cover my hair (for the two mosques we entered, I did not). While I still don’t think I will go waltzing into mosques unaccompanied any time soon, it was reassuring to know that I could. Near the pier in Makassar, there is an area called Pantai Losari. Though its name implies it is a beach, it is more of a boardwalk, which is apparently full of various penjual (sellers) at night, and is a popular hang-out place. Since it was mid-day, it was fairly quiet, but we were still able to wander from statue to statue, all of which represent different aspects of the four main cultures in South Sulawesi: Makassar, Bugis, Mandar, and Toraja. Each culture has its own of the pier, something I thought was actually quite cool. There was even a small art gallery, which I, of course, also enjoyed. The entrance to Pantai Losari. The folks from my program placed in Makassar always say that while there are certainly a few interesting parts of the city, the best part of Makassar is the food. So I was sure to try a few kinds while I was there. On my way to Toraja, I had Sop Ubi, a soup similar to bakso, but with cassava in it. On my way home, Fera took me to eat Mie Titi, a seafood and noodle dish with crispy noodles, rather than the soft noodle more commonly found in Indonesian dishes; and later we had Pisang Ijo, a desert dish that is composed of banana, mung bean, sweetened milk, and ice (I was a little confused as to how it was from Makasssar, because I am fairly certain “ijo” is the word for green in Javanese, but either way it was amazing: I think I found my new favorite desert). My friends weren’t lying: all of the food was enak sekali. Mie Titi, before and after it was mixed, and Pisang Ijo. Makassar is a large, fairly overwhelming city, and so I’m glad I had friends there to help me find my way around. Gorontalo, while technically a city, is essentially an overgrown town, and this small-town farm girl would not have been able to take on the Big Mak, as we call it, alone. Still, it is the center of everything in South Sulawesi, a perfect place for me to learn about this unfamiliar corner of Indonesia, and a city I wouldn’t mind visiting again. I want to begin this post by pointing out that I am not an expert in either religious studies or Indonesian history and culture. Though I had developed a limited understanding of religion in Indonesia prior to arriving here, and though I have sought to further that understanding through continued reading and asking as many questions as I have deemed polite, I still feel as though I have barely scratched the surface of this dense and multifaceted topic. What I present here should not be treated as gospel truth: it is merely a collection of personal observations I have made during my time here, intermittently accompanied by more technical, “factual” context where I have deemed necessary. The greatest hope I can cherish for this blog post is that it may inspire some to delve more deeply into the topic of religion in Indonesia, one which I promise will not fail to captivate. Agama (religion) in Indonesia is fascinating and complex. Indonesia officially recognizes only six religions (Islam, Protestantism, Catholicism, Hinduism, Buddhism, and Confucianism), and in theory all citizens prescribe to one of these religions. Semi-officially, they must do so in order to receive an identification card (in reality, I have heard that people will switch this religion readily in order to get married to someone of another religion, sometimes without actually changing their belief system, and I have even heard that it is possible to leave that part blank, though I have not yet met anyone personally who has chosen to do so). Even to register the Nokia mobile phone with which AMINEF provided all of the ETAs, I had to choose one of the six religions. In reality, there is a presence—if small—of other religious thought in Indonesia, though it is difficult to ascertain the exact nature of how they operate within the Indonesian context. For example, there is a very small Jewish population in Indonesia—which has suffered various degrees of anti-Semitism, depending upon the time period and location—but it is unclear as to the exact size of this population, since Judaism is not officially recognized. And while religiosity does differ from person to person, and I’m sure that some Indonesians harbor beliefs which lean towards atheism or agnosticism, I have yet to meet any who openly identify as such. Because while Indonesians are more-or-less accepting of different religions, there is a certain expectation here that everyone is a believer in something. I am asked which religion I belong to every bit as casually as I am asked my name and where I am from, and I doubt it crosses anyone’s mind that I might not belong to any religion. Religion is a give-in here. Religion is also exceedingly more present in Indonesia than it is in America. We pray at the beginning and the end of every school day, even though we are not an explicitly religious institution (there is no separation of church and state here). No hope or wish can be expressed without someone breathing a gentle “Amin” (Amen) or “I’ll pray for you”, and nothing good can occur without a joyfully expressed “Alhamdulillah”. The United States is not devoid of explicit expressions of faith, but I feel I can say with some conviction that they are not nearly as prominent as they are here. Religion has infiltrated every aspect of life here, it seems, which is possibly why I have given it so much careful thought over these past seven months or so. I have identified as Katolik (Catholic) while I am in Indonesia. My connection to this religion is not completely false—my immediate family, and a good portion of my extended family, is composed of devoted Catholics—but the fact remains that I chose to never be confirmed and have not attended mass regularly since I graduated from high school. Consequently, I have avoided attending church while here: there is only so much hypocrisy I can tolerate in myself. 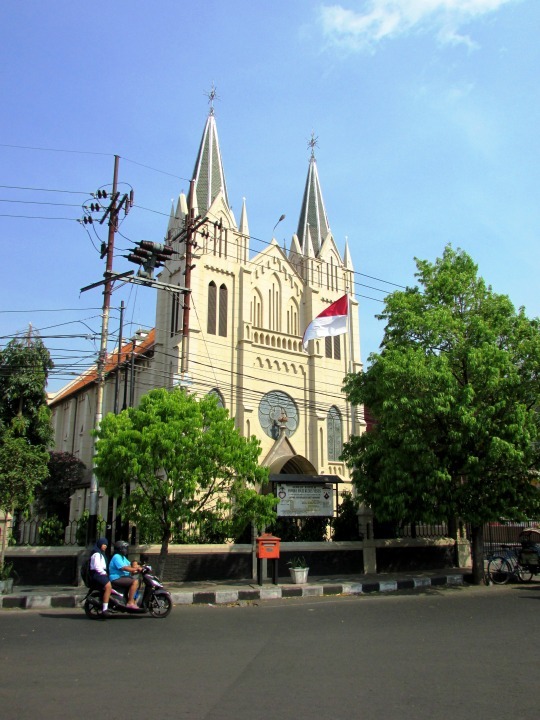 Curiosity does tend to get the better of me, however, and I found myself wondering how an Indonesian Catholic mass might compare to one in the United States. And so, on Easter Sunday, I accompanied a small group of my students to mass. For the most part, the experience was very similar to those I had every summer Sunday for the first eighteen years of my life. The pews were uncomfortable; the ancient, clacking fans did almost nothing to chase away the stifling heat; and more than one of my students nodded off during some of the more monotonously delivered readings. The hymns were sung both beautifully and off-key, but always joyfully; the priest—an energetic man I couldn’t help but like, even if I did not understand most of what he said—began his homily with a hearty “Selamat Paskah!” (Happy Easter), and cracked jokes throughout, eliciting smiles and laughter from the entire congregation; and there was a general feeling of community which, while not limited to religious institutions, I have found is always present in such places. To be sure, the pure white lilies traditionally associated with Easter were of a more tropical nature, and people’s Sunday best seemed much more likely to consist of batik, but for the most part, the similarities seemed to considerably outweigh the differences. That is not to say that more substantial differences did not exist. There were entire sections of the mass I did not recognize, and during some of the call-and-responses, I found that even the Indonesian I could understand did not quite translate to that with which I was more familiar, and which I habitually said, a small English whisper in a chorus of Indonesian. My Indonesian is not sufficient for me to fully understand or explain all of the differences, but this much is clear: it was not just a mass in Indonesian which I attended, but an Indonesian mass. In some instances, it seemed the parts with which I was unfamiliar might be attributed to the congregation being generally more religious. The bowing and hand raising I have always seen described in the margins of the missal-ette (noticeably missing from the pews of the church I attended in Indonesia), but happily ignored by every Catholic I know, were well-known to even my students. In fact, my students used various hand gestures I generally associate with only the oldest members of the congregation: even most of those in my parents’ generation do not use them, and I know of none in my own who do. This strict adherence to the traditions of the Catholic Church would fit with my overall impression that religiosity is stronger in Indonesia than it is in the United States, but I cannot claim for certain that this is the case. There was also substantially more singing. Even the early morning Sunday mass at Saint Bernard’s—which my parents prefer to frequent in part because it tends to include more singing than the other masses—could not compare to how much I heard echoing in this Indonesian church. This didn’t really surprise me: if there is anything I can say confidently about Indonesians, it is that they enjoy music to no end, and are generally much less hesitant to sing in public than most Americans. It is possible that the amount of singing I encountered was partially due to it being Easter Sunday, but even the holiday masses I have attended at home have never been so musical, and so I believe at least part of its presence was due to the culture. I felt it only appropriate, really, that the one time I entered an Indonesian church I encountered more singing than spoken word. I also observed that the demographics of the congregation’s population were very different from what I am accustomed to seeing in Malang. There were significantly more people present who, from their darker skin and in some cases unique batik, I thought might possibly be from Papua or NTT (Nusa Tenggara Timor, or East Nusa Tenggara). Though I had not predicted this, it did not surprise me. Though when the overall population is considered, Indonesia is a majority-Muslim country, it is really western Indonesia which is predominately Muslim. Much of eastern Indonesia, especially including NTT and Papua, is actually predominately Kristen (Christian) and Katolik, and it is only because the population is so concentrated in the western part of Indonesia that it is the largest Muslim-majority country in the world. In Malang, I have met very few people, outside of my own scholarship students, who are from outside of Java, and to meet so many in one particular place of worship says much, I feel, about the incredible diversity across this archipelago, and the role religion plays in this diversity. Still, there is no denying that in East Java, where I am placed, there is certainly a Muslim majority. Masjid-masjid (mosques) dot the landscape wherever I go, and I have come to understand time by the call to prayer. This is my first time living in a Muslim-majority culture, and I have gained so much from the experience. 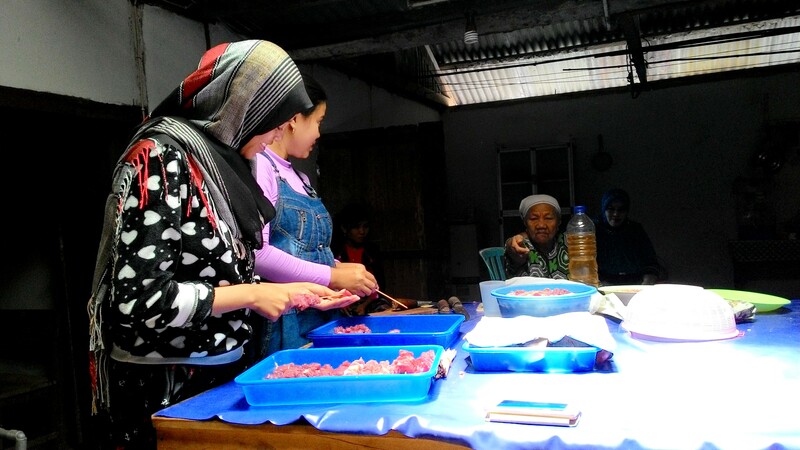 I have had the opportunity to attend Islamic holiday events such as Idul Adha, and have the traditions and stories explained to me by my ever-patient students. I have been blessed with the trust of students who have come to me for support and advice as they decide if they are ready to begin wearing the jilbab, or veil. Perhaps the greatest lesson I have learned from this experience is that of the powerful dichotomy between local and global perceptions and privileges, especially as it relates to Islam. There is no denying that my Moslim students benefit from being in the majority here, from the ease in which they are able to attend their place of worship, to their security in knowing that most of their peers will understand their religious tradition. My Christian and Catholic students must travel the half hour into the center of Malang in order to worship, and my few Hindu students have on occasion expressed to me that it is sometimes frustrating how little their classmates know about their religious practices. It seems, then, that my Muslim students are at a distinct advantage, at least in East Java. But my students are not separate from how the larger Muslim community is treated on a more global scale, and this complicates their experience. Many of my students have turned to the internet to help them practice their English, through chat rooms and e-mail pen pals. Some them have told me stories of how people have accused them of being members of ISIS, or various terrorist organizations. One of my girls became visibly upset as she told me how a pen pal of hers, whom she really liked and hoped to someday meet in person, had sent her an e-mail after learning she was a Moslima, and asked her, “Why are your people killing us?” She tried to explain that it was not, in fact, her people who were committing violent crimes, and that she in no way condoned their actions, as “that is not Islam.” Eventually, she had to terminate all contact with her pen-pal, as her voice was not respected. My Muslim students, many of whom aspire to study abroad in Europe and North America, often ask me various questions about whether or not they would be able to find a place in Western society: “Miss, can I find Halal food in America?” “Miss, are there many mosques in America?” “Miss, will people stare at me if I wear jilbab?” The shootings in Chapel Hill led some of my students to go so far as to ask me if they would be safe if they were to study in the United States. I try to answer them as honestly as I can, acknowledging that there is very present prejudice against Muslims in many Western places, including the United States, while also ensuring them that there are allies everywhere, and that they should always be able to find someone to help them. Living here has, in some ways, changed how I think about my responsibility within the religious tolerance of my own country. As my students express their various curiosities and concerns, I find myself thinking about how little most Americans know about Islam, and how strong Islamophobia is throughout the country. Many people—both from my small home town and from the supposedly-educated university city where I attend college—when they learned where I would be going after graduation, asked me why I would ever choose to live in a Muslim-majority country. Then, I was frustrated by their responses, and tried to politely contradict them. Now, when I read articles about anti-Muslim acts and statements, I see the smiling faces of my Muslim students, some of the sweetest and most intelligent young people I know, it is hard for me to control my fury. Then, it was an objective recognition that the way many in the United States treat Muslims is wrong. Now, it is personal. I am still unsure how to react to this new passion for religious tolerance, and for now I am merely seeking to educate myself more fully, but I do know I must continue to consider my own personal responsibility, and how my experience in Indonesia will play a role in that. In truth, perhaps the only statement I can make confidently about all I have touched upon in this post is that I am unsure about everything, and still learning. Quite frankly, I could probably make that statement about everything I have sought to comprehend in this incredible, baffling place. I have decided to label this post as “Part I,” because this is a topic, amongst many others, which I will continue to explore when I return to Indonesia this fall, and will probably, quite honestly, study for the rest of my life. Even then, I don’t know that I will be able to come to any real conclusions, and will simply continue to find joy in the wonderment and confusion that comes from trying to understand the world I live in. Much of the contextual information I provide here stems from what I learned prior to arrival. I was fortunate enough to take a World Religions course during my senior year, and I focused on religion, specifically Islam, in Indonesia for my individual research project. Regretfully, the entirety of my work for that class was lost to the capriciousness of computer memory, and I am unable to provide the reading list for that project, interesting and informative though it was. As I acknowledged before, anti-Semitism does have a fairly strong presence in Indonesia, and various other inequalities and prejudices exist as well. I am in no way qualified to pass any kind of judgement on the quality of religious tolerance in Indonesia, though I have sought to understand it, in part through comparison of what I know of the religious tolerance in my own country. Although they do function in different ways, I have come to see Indonesia’s purported religious tolerance in the same way I see the United States’: technically, it exists, and there are many individuals and organizations which put this idea into practice in wonderful ways, but it is also undermined by both outright and unintended prejudice (which are equally dangerous, in my mind), on both an individual and systematic level. Though phrases like Alhamdulillah come from Arabic, and other ETAs have been told they cannot say such things unless they are Muslim, in my experience here even the Christian teachers use them. I cannot say which opinion regarding their use is more prominent, and can only appreciate the difference as yet another example of the diversity present in Indonesia. This is not to say that I do not have the utmost respect for religions and those who practice them. I have sought to learn more about various religions in our world both formally and informally, and for the most part I find religion to be quite beautiful. I have merely decided that practicing a religion is not for me personally, and while I have not felt comfortable with the idea of talking about that here, I do not want to pretend to be especially religious either. My students, some of whom are themselves from these areas, were able to confirm this some cases, as they knew those particular members. However, I cannot confirm that all those I saw are originally from outside Java, and it is quite possible that they were born and raised in Malang. As I did not speak with most of these individuals, I do not know. Traditionally, once a woman dons the jilbab, or veil, she must continue to wear it in public for the rest of her life. In practice, I have met many Muslim women who started wearing the veil, and then chose to remove it later in life, as well as others who work in religious institutions and wear their veil to work, but not in other public spaces. I have not personally observed any difference in piety between those who wear the veil and those who do not, but there are some who believe that wearing the veil makes one a better Muslim. It is easy, then, for me to see why this is such a difficult decision for my girls to make. I have one student who stopped wearing the veil, after having worn it since elementary school, and I have another who started wearing it for the first time, even though her mother insisted she would look more beautiful without it. The careful consideration they give to this decision is a testament to their maturity, and the wisdom they already possess, and I am honored that they have confided in me throughout the process.